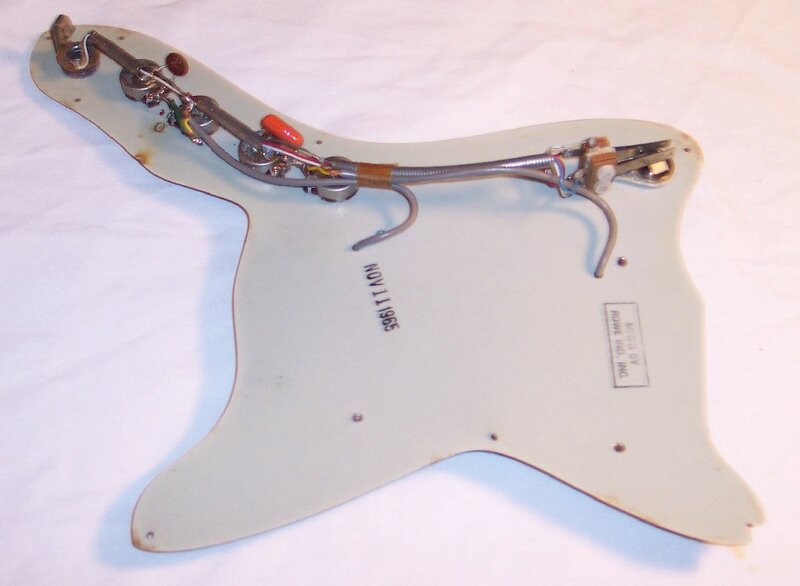 NOTICE: The pickguard / electronics assembly shown on this page was replaced with the electronics assembly taken from the donor guitar that was purchased to replace this guitar's broken trussrod. Other parts on the donor guitar that were any better than this guitar's original parts, were taken from the donor guitar and put on this guitar. The text on this page applies to the replacement assembly as well. 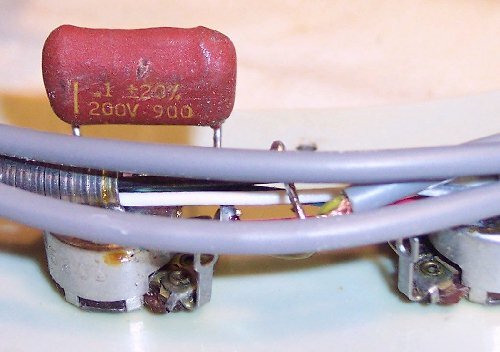 The electronics assembly put on the guitar is the same as the original one shown below; Except that the donor assembly's date of manufacture was 10 July, 1967. The replacement electronics assembly can be viewed on Page 16. The electronics schematic that is the same for both assemblies can be viewed on the next page, Page 7b. CLICK HERE to reference the Electronics Schematic Diagram. 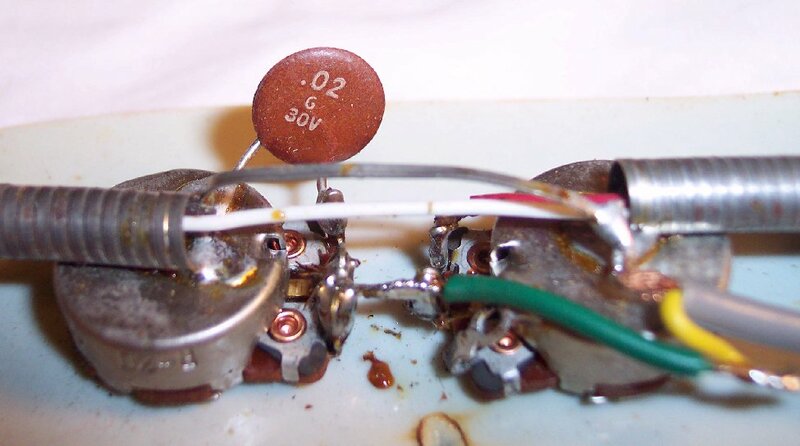 This electronics assembly was finished on November 11, 1965, ....and is even more reliable for the guitar's near-date of manufacture than pot codes. These Harmony harnesses were a very good design of quite high quality. These small pots had a folklore reputation from amateur Guitarists and biased technicians who thought they came from Japan (but didn't), for being cheap (because they were small), but they actually came out of NASA R&D and have proven to be as good and reliable as larger pots. 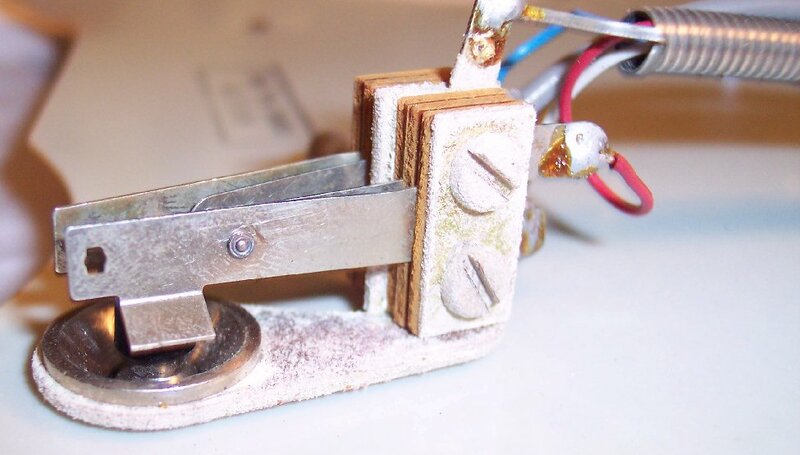 Here's the cap on the bridge pickup's tone pot. It's original. .02uF 30V. Shown here is a couple of innocuous boo-boos made by someone: (1) For some unknown / unobvious reaon (s)he desoldered and reinstalled the bridge pickup lead, but in "skinning it back" wound up with too short a lead, and thus added the green extension. (S)He did a pretty darn good job with the actual solder joints, and so far I see no need to redo it, ....but far from experienced professional as is evidenced by the lead extension joint not being clipped clean nor shrink wrapped, and (2) (s)he dropped 3 drops of hot solder onto the pickguard that reveals (3) (s)he was using flux-core solder rather than hand fluxing the joints, evidenced by the brown splatter of flux when the solder drops hit the pickguard. The pickguard was thick enough to cool the solder before it had a chance to melt through the first of 4 laminates in the pickguard. No damage done but another example of tell-tale signs of a vague story in the guitar's history. ~~~~~~~ This is a good example of it being wise to practice on other things until you get good enough to think out a repair real good; Like knowing to not load up your solder gun more than is needed for the solder joint ....lest you drop hot drops, quite painful if one drops on your hand, down your shirt or even onto a pants leg!. A simple piece of aluminum foil used as a drop cloth for the work would have prevented the solder drops from slightly burning the pickguard; And it could have been much worse ! I will clean up this job the bit it needs. Now how did I know, as said on a previous page, that this guitar has been played allot into an amplifier that didn't have a center neutral grounding lug on it's AC wall outlet plug (or possibly allot in an old house without a center lug neutral ground)? 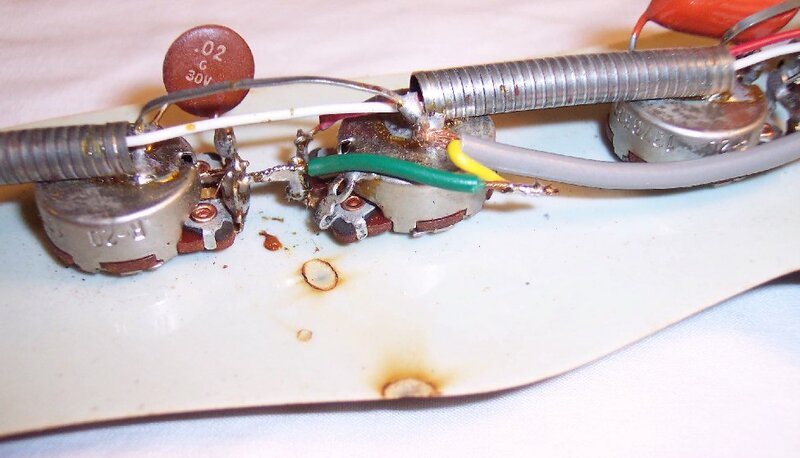 Well, besides a few other places where small traces of electrolysis deposits existed, .......I also noticed this heavier deposit on the "more sacrificial" alloy plates of the pickups switch. When electricity is generated or exchanged, such as pickups generating AC signal electricity, or an amp's operating electricity and amplified signal, ....electrons are flowing from the generating source(s) along different routes that wind up at a same / common ground / earth source that can absorb them (actually the electrons are sequentially kicking each other out of atomic orbit in a dominoe chain effect along circuits of conductors towards that ground / earth) ....and if there isn't enough ground / earth source then electrons start inter-reacting more with metals (atoms) that are more prone to exchange their electrons; And aluminum, magnesium and zinc are common metals in guitar alloys that exchange their electrons more readily than other metals in guitar circuits, and in doing so those more "sacrificial" alloys leave an oxide on their surface; Voila tell-tale deposits on the thin aluminum "foil" of the pickups, and especially here where these much heavier and more sacrificial alloy plates exist. It is likely that hand sweat salts & oils cumulatively running down the switch shaft accelerated this oxidation. You will not see this degree of oxydation on guitars that have been played into amplifiers with more than ample ground. An original cap on another guitar, viewed from the opposite side of the pot where the values are visible. ( .1uF +/- 20%, 200V ).